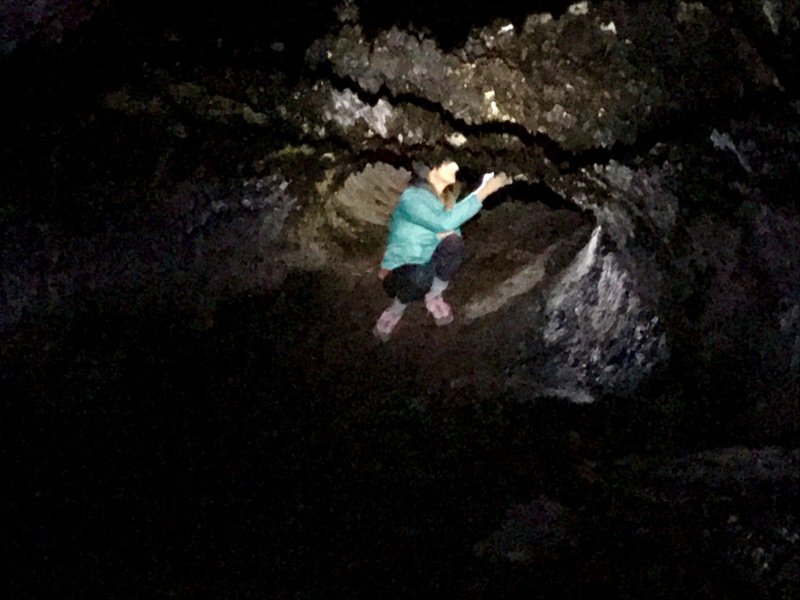 Brice Pollock » Self Guided Lava Tube Caving at Lava Beds Nat. Mon. Watching my head on the descent, I reach the hard floor which takes forms ranging between a carpet comprised of heads of cauliflower to the slow rolling, pillowing, smooth surface I’m familiar seeing in active lava flows. 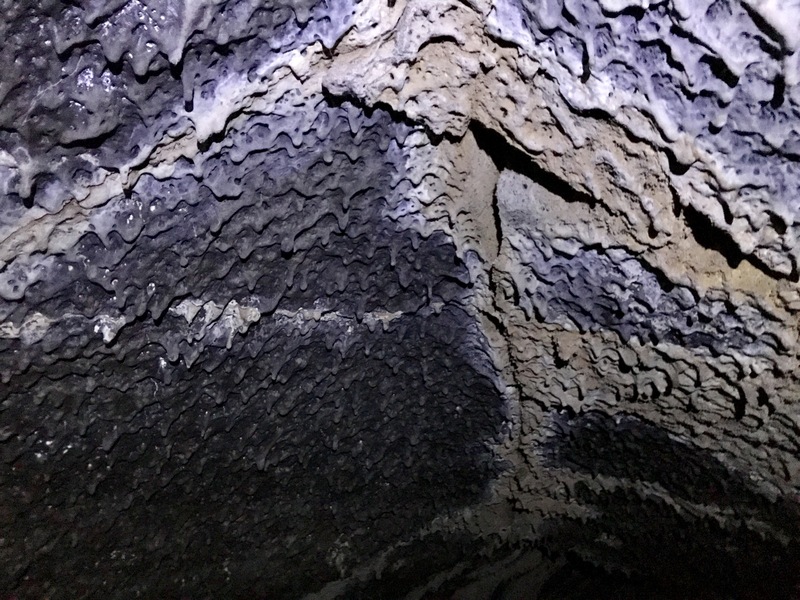 For the next forty minutes I walk, stand and stoop with mouth agape looking at the lavacicle ceiling formed from dripping lava as the tube cooled. In one room the domed roof alights with iridescent micro-bacteria glowing gold, silver and green through beading moisture. While later, smooth lava benches a couple feet high appear that were created from lava cooling as it curled and built up around corners. Unfortunately this is the best the microbacteria can be captured. You really need to see it in person. 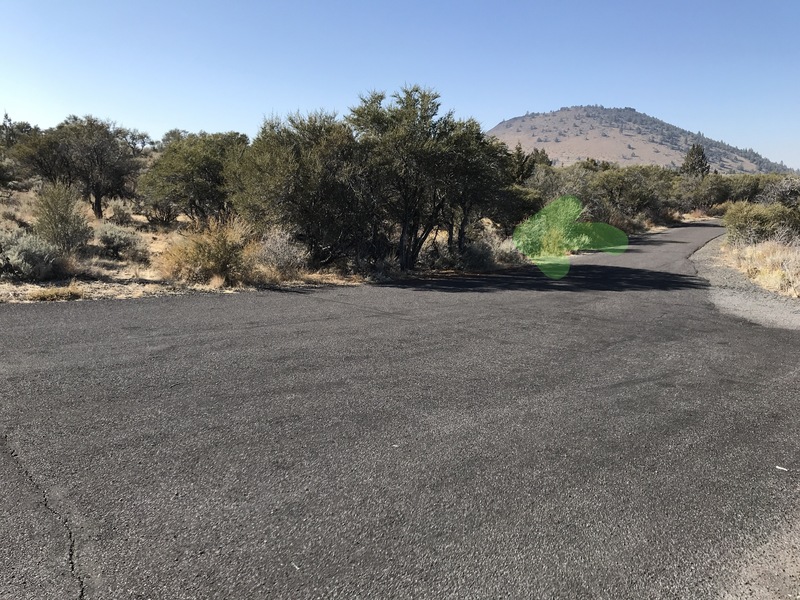 This may be the most unique preserved space in California, yet I can’t imagine it get much traffic given it’s location northeast of even the least visited national park: Lassen. It may be off season, but new with a dozen cars in the parking lot I spent a whole day caving in solitude. This experience is so incredibly special because rarely are visitors allowed to self-explore caves without a guide anywhere in the world, let alone the lawsuit ridden USA. 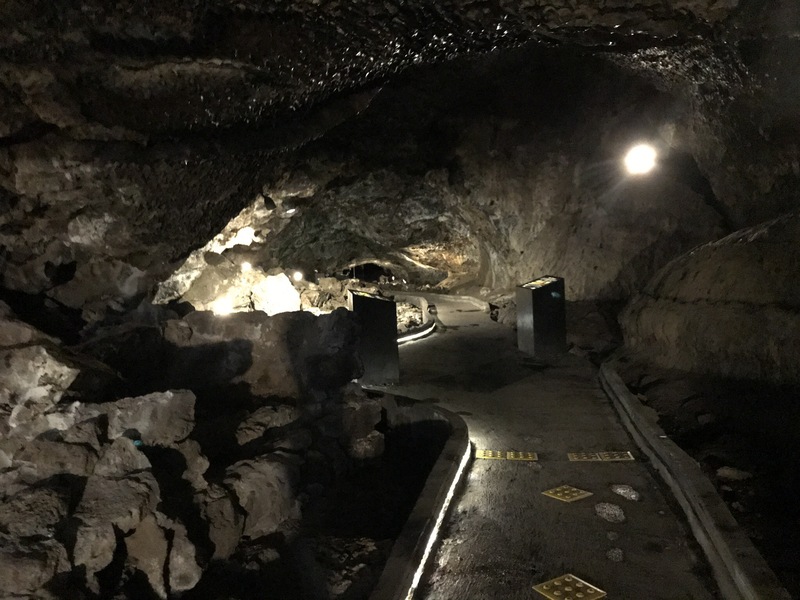 Furthermore, I know of no other place in the world where within a walkable 2 mile loop it is possible to spelunk for a whole day, traveling multiple miles underground, through over a dozen caves. Given the low light in the caves the pictures don’t do this justice, but it is beyond cool to explore for hours tubes through which lava used to flow. Firstly, even if you don’t want to crawl or stoop through caves there are plenty of caves you can walk through. Most the caves are wide enough where I never felt too constricted and short heights typically provide regular reprieve to stand. I am 6’6” so if this was good for me, it will be good for you. 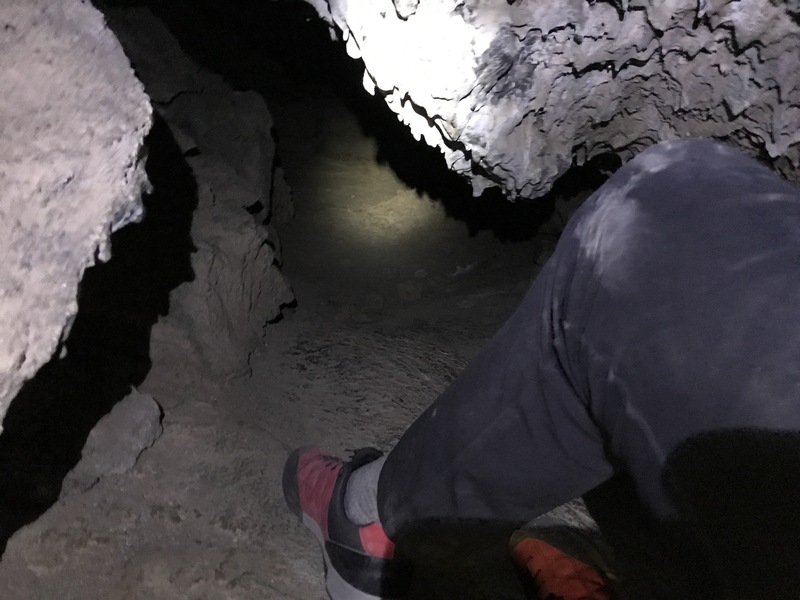 Knee pads would have been nice for any of the “most difficult” caves because the floor is rock hardened in irregular shapes that are painful on knees. However, I was able to crawl through short sections with a little extra physical effort and discomfort trying to keep my knees up for any tubes three feet or higher. For shorter, knee pads are probably mandatory. Before caving, pay the entrance fee and check out the awesome museum. This place has tons of unique geological features, native rock art and military history. They also sell knee pads, provide a good map for Catacombs, tell you which caves are closed for bat hibernation and rent large flashlights for free. 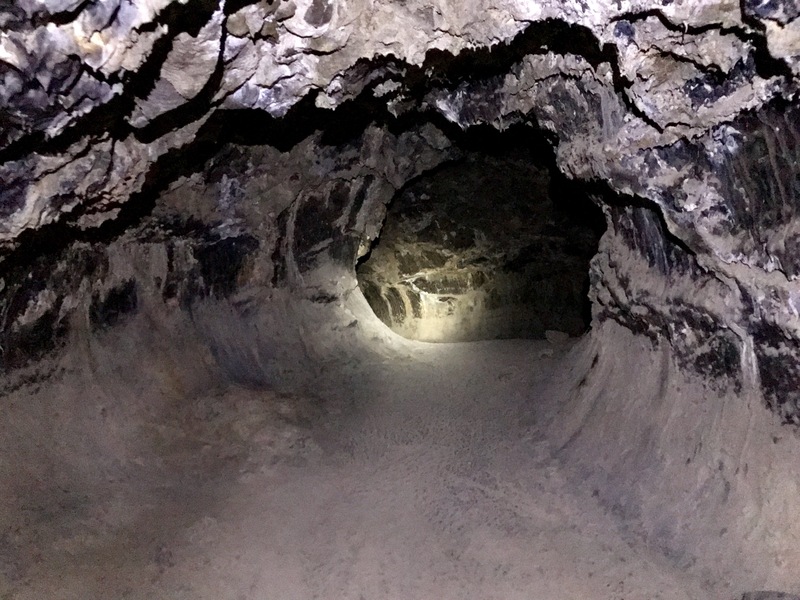 You will want a strong light and it is required to carry at least two independent sources of light when spelunking. It is dark as space down there. For any of the “hardest” caves a map is required. I was able to use this online guide all day, except for catacombs where I had the park provided paper map. As a note, the numbers on the map indicate ceiling height. …and Big Nasty Trail because that’s a sick name. Having fully explored the cave loop, this would be my itinerary for seeing the best of the loop. 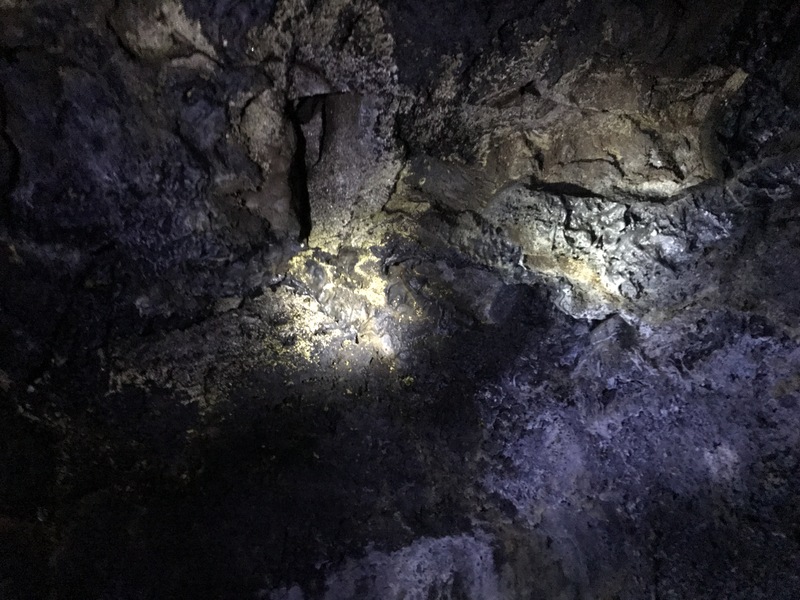 Start by entering the only illuminated cave in the park, Mushpot, to read its informational panels and learn about all the features you will see throughout the day. This context really made me appreciate my environment. If Labyrinth is closed, continue past on a short trail to Thunderbolt. Crawling or crouching through the tight beginning surprisingly leads to a tall ceiling and beaten path for the rest of the cave. 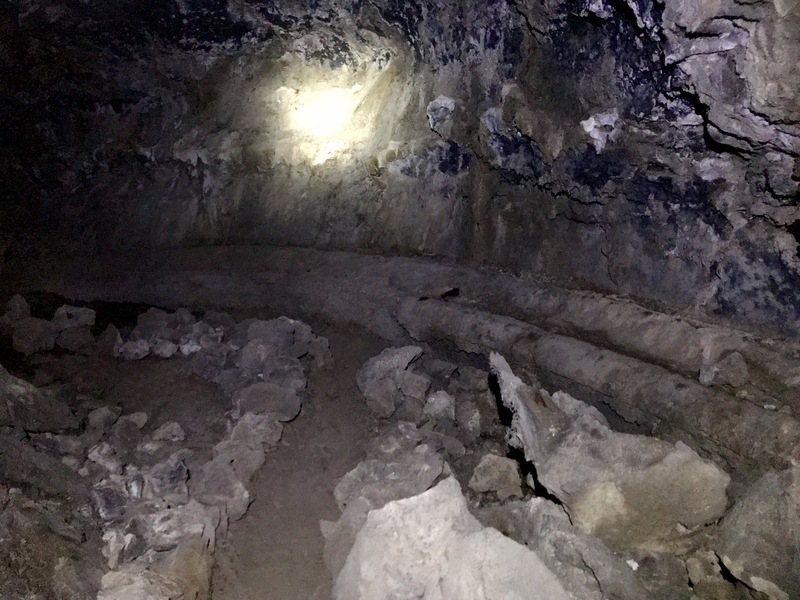 A little further you enter a room where the trail goes up some talus and the cave forms either straight (left, exit) or hard right. The right is much more rocky and irregularly chiseled with a cool lava bench. While the left is longer and feels more like a drilled, rolling lava tube. 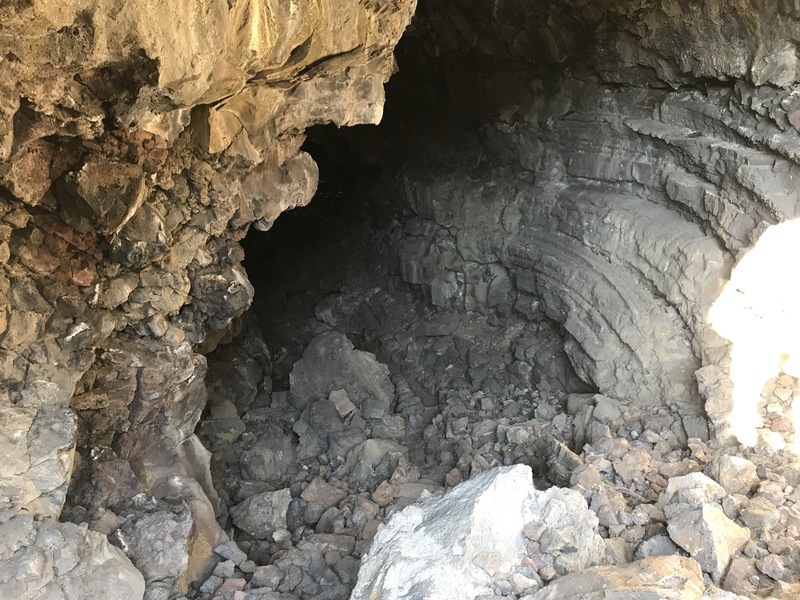 Both caves exit onto the surface via a collapsed lava tube trench a short distance from Lower Sentinel parking lot. If you are feeling adventurous, take a trail left just down from sentinel to a large trench. 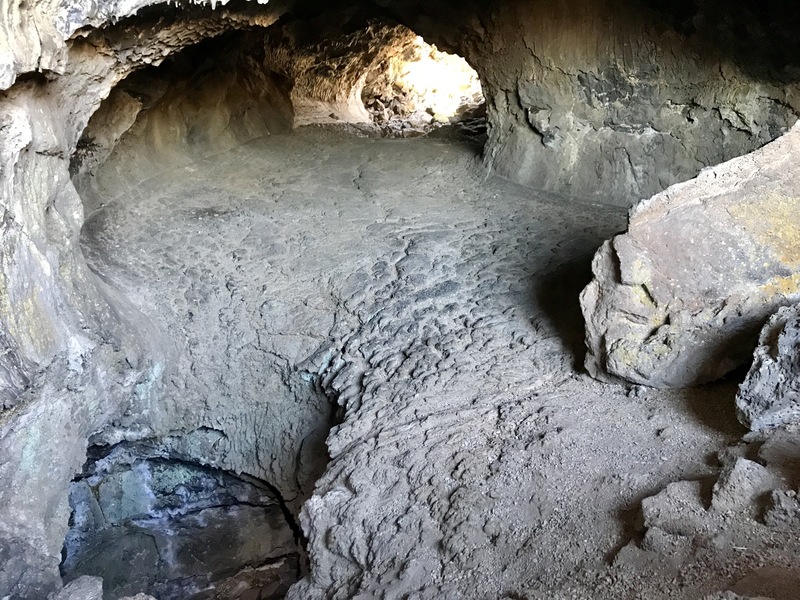 Any of the caves here will lead you on an adventure and I would encourage you to explore as there are multiple cool crawling sections that frequently break into the surface. Eventually however take the cave to the North of the large trench, this is the exit to Blue Grotto. I maybe saw a blueish-gray Grotto but more interestingly is how this cave can wind and turn around with multiple levels. When exploring this cave from the entrance I started on one level and then after 45 minutes found myself in the hole at the beginning. It was super fun. Next, walk north to the catacombs. Despite being intimidated by the complexity and length of the cave, it actually starts quite wide and tall. 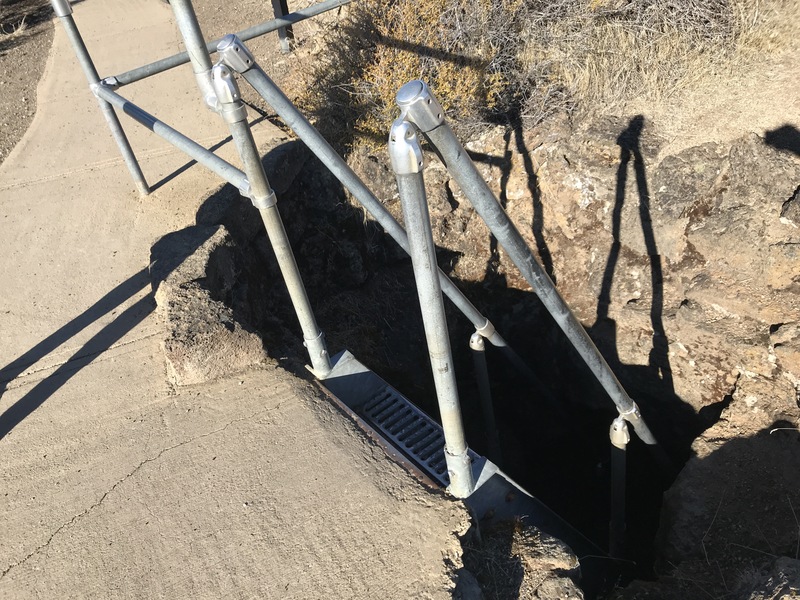 It is only until halfway (3000 ft) where it is required to crawl through the most terrifyingly tight two feet I’ve ever seen. 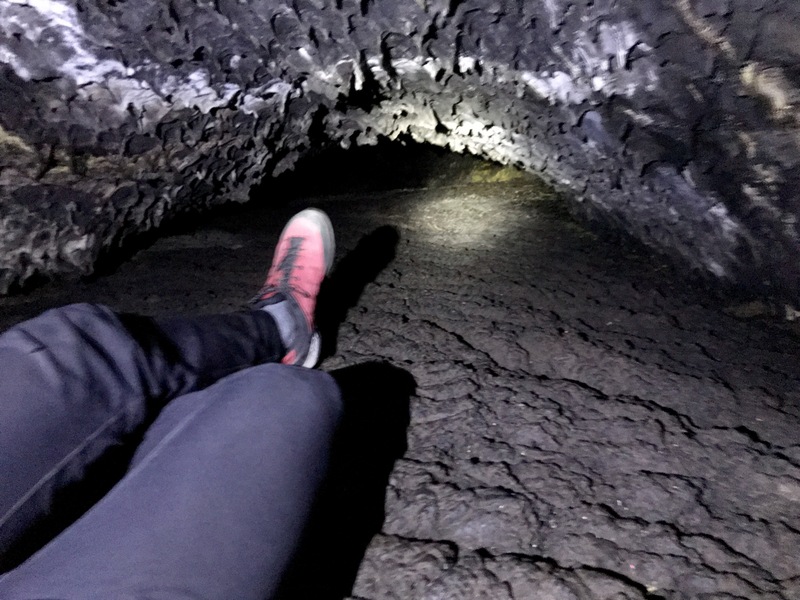 In the mean time there are cool features like the lava Wine Cask pillar, the Boxing Glove chamber which looks like a bubbling chocolate fountain frozen in time and some incredible multi level lava tube junctions. Exiting the cave the way you came, walk down the road to Paradise / Ovis. Ovis is the largest tube you’ll have seen all day which, while short, links up with more normally sized Paradise for a nice contrast to ponder the amount of lava flowing though here. Paradise itself feels short for the length but is notable for its multiple levels with ladders going up and down off the main level. Another short walk up the loop the Sunshine entrance can be found down a quick dirt trail. This out and back is punctuated with multiple skylights requiring stooping for most the length. The floor is typically smooth until the lower level is reached. A little exploring down here and you’ll be rewarded with a view inside the small chamber of the mouse hole featuring a roof of irridecent gold and silver. Finally, walk the loop to the start and visit the brilliant microbacterial visual brilliance of gold, silver and green in Golden Dome. Feeling drunk, walking unsteadily across its heavily irregular cauliflower floor while taking care to not get turned around in its figure-8. 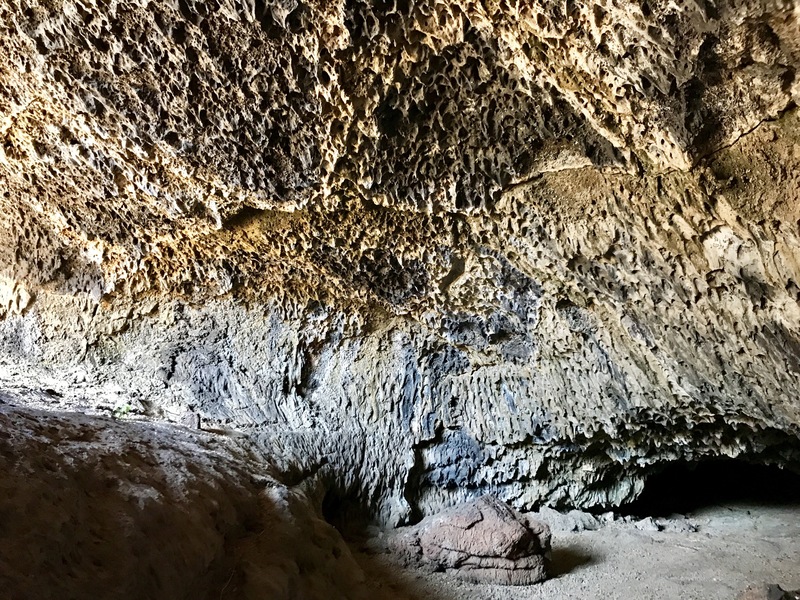 After leaving the loop, drive for one last spelunk at Skull Cave, check out the splatter cone creations of Flenner Chimneys and finally gaze on the native art at Petroglyph Point. What an amazing place to visit for a day or a weekend.